Joey Elias, left, and Noel Butler. Elias is the professional comedian. Late nights on CJAD will never be the same. After more than 10 years hosting the late-night Comedy Show, Joey Elias has stepped away from the microphone. On Friday, Elias promised a big announcement. And it was big: that show would be his last. The 11pm hour weekdays has been replaced by a simulcast of CTV National News and CTV Montreal’s 11:30pm local news. It’s unclear if this is a temporary or permanent thing. CJAD Program Director Chris Bury did not respond to a request for comment. 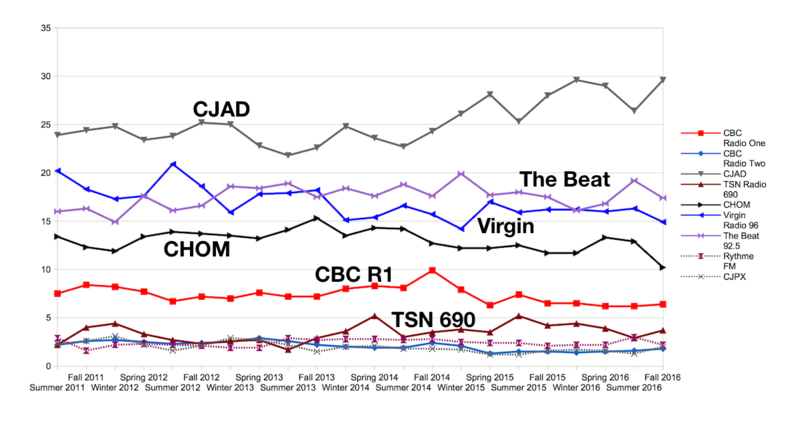 Though rumours quickly spread that Elias was cut as a cost-saving measure, especially as it came around the same time as other Bell Media cuts. But Elias says it was his call. Meanwhile, CJAD has also lost the Chris Robinson Travel Show, which aired on Saturdays. A Facebook post by the show says it’s on “sabbatical” and will be off the air for “a while”. TSN 690 being received via HD Radio signal on 107.3 FM. As major Canadian broadcasters begin their experimentation with HD Radio transmitters, Bell Media has quietly launched a transmitter on its CITE-FM station in Montreal (Rouge FM 107.3), and is using it to simulcast CJAD 800 and TSN Radio 690. The Rouge FM station was chosen for this for technical reasons. I don’t know specifically what they are, but CITE-FM is a full-power station (currently at 42.9kW), and has plenty of space on both sides of the frequency to accommodate the extra channels without causing interference to adjacent-channel stations. There are no plans “at this point” to add more HD channels. Two and a half months after Natasha Hall left 92.5 The Beat with a mysterious new gig lined up that she couldn’t talk about, we finally know what it is: She’s taking over, along with Jon Pole, as the hosts of the weeknight talk show on CJAD, which replaces The Exchange as of next week. The Exchange’s current hosts, Dave Kaufman and Dan Delmar, are both leaving that job. Kaufman is moving to London to be with his girlfriend and Delmar is taking a step back to focus on his PR business. The new show is called The Night Side, and begins Monday at 8pm, CJAD announced. Pole hosts Mondays and Tuesdays and Hall hosts the rest of the week. In the few years I’ve been writing about local media, I’ve met and talked to a lot of broadcasters and personalities. Change being a constant in this industry, there was always a hiring, firing, resignation or other major change that would make someone newsworthy and prompt a story. I’ve never spoken with Dave Fisher. And that’s mainly because he’s been the weekend morning host at CJAD for 32 years now, which is a pretty incredible run. He’s just been there, reliably hosting some of he most popular station’s most popular shows, without much fanfare, without TV ads, without billboards showing his face, without being considered a major celebrity. Now, finally, change is coming to him. This morning, it was announced on the air and in the Montreal Gazette that Fisher is retiring from the station this August. The Gazette’s Bill Brownstein does a much better career obituary than I ever could, so I encourage you to read that. CJAD also has a short story, and CTV is covering it. You can also watch, thanks to CTV, Fisher explain his retirement on the air this morning. And read Bell Media’s press release on the subject. Fisher’s replacement on weekend mornings hasn’t been announced yet. Aaron Rand has cemented his reputation as a reformed music DJ/morning funny man turned serious talk radio host after his show won the national Peter Gzowski Award for a news information radio program from RTDNA Canada (formerly the Radio and Television News Directors’ Association) for its coverage of the Lac-Mégantic disaster last year. It’s among the highest honours that a show like this can receive from peers. CJAD is the only Montreal winner in either the radio or television category to bring home a national RTDNA Canada award from the ceremony giving them out this weekend. Aaron Rand was sent to Lac-Mégantic after the disaster, in which a runaway train derailed in the city and killed 47 people. The broadcast of July 9, from the Polyvalente Montignac school, was submitted for the award. The station plans to send Rand back to Lac-Mégantic for the first anniversary of the disaster, probably for a week of shows.